Lightweight and brightly colored cotton summer rugs are a seasonal alternative to Oriental carpets. 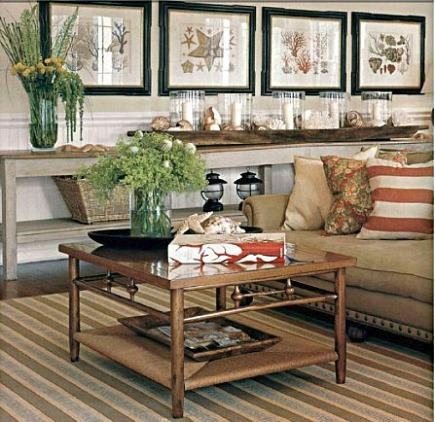 Take a look at beach house decor and you’ll likely find a variety of striped cotton summer rugs. Unfussy and cool on bare feet, they’re often the first rug of choice for cottages and seaside homes. 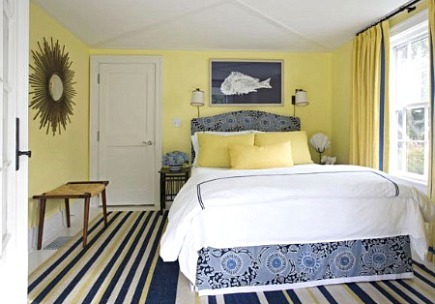 This beach-theme Nantucket bedroom by designer John Willey sports a typical summer palette of butter yellow and ocean blue accented with seashells, sunburst mirror and fish artwork. But it’s the boldly colored and striped flat-woven rug that bumps this room up to sea lover category. Cotton summer rugs are not limited to coastal cottages. Even the most traditional decor can take on a summer flavor by pairing lighter floor coverings with seasonal accessories and linens. 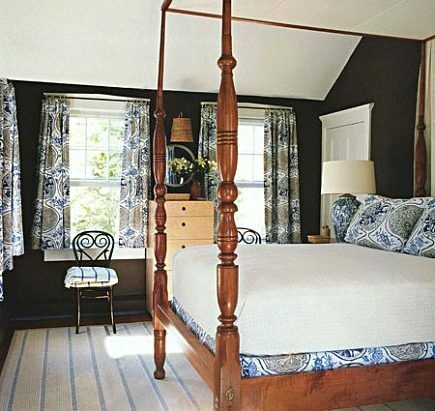 Dramatic dark walls and a canopy four poster bed could easily partner with a plush Oriental rug during the winter months, but designer Tom Sheerer created a summer retreat in this bedroom by utilizing a solid bright white coverlet and striped cotton rug in hues of cornflower blue and soft beige. The cotton rug looks equally at home in this setting as it would in a beach house. Once again we see the influence of white, this time in the picture mats and pillar candles in a room by designer Scott Sanders. The rug’s darker stripe adds a strong dimension, connecting it visually to the various earth-tone colors and wood textures in the room. 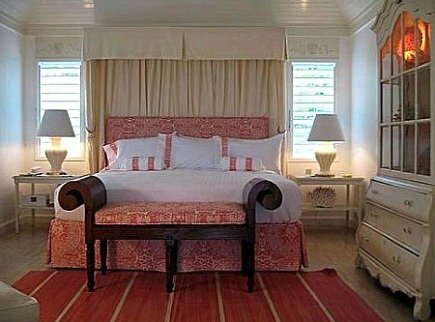 This guest room designed by Meg Braff for a Jamaican resort is also versatile enough to transition from summer to winter by swapping out the red cotton rug and white linens for thicker, plusher materials. Note: Cotton rugs should be securely anchored to the floor with a good pad. The corners (as evidenced in the red rug above), can be prone to curling. A good pad choice would be a tacky pad such as the brand Teebaud. Also, cotton rugs come in many colors and sizes. If you need a larger size than what is readily available, buy two and stitch them together. It’s easy and quick to do.